Q. Congratulations. First of all, we are used to clapping the winner in the press room. Q. Can you tell us what changed in Nadal during this tournament? Because just few days ago you say if, I play like this, I cannot win the tournament. You won it and you deserve it. RAFAEL NADAL: Well, I think sometimes can happen this way; sometimes not. But what I said one week ago is I am going to put everything to try to change the situation, to try to play better, and that's what I did. I try my best in every moment with the right attitude all the time, so finally I was able to play my best when I needed my best. So for that reason, today I am here with the trophy. Very happy for that. It's a big personal satisfaction to win this tournament, especially when you started without playing your best. My mind was open to change the situation, so that makes the victory probably more special ‑‑ if it's possible be more special, because win Roland Garros is always ‑‑ you can't win something more special, no? It's the highest level of tournaments in the tennis world. So in general, very, very happy for everything. Q. You always say that this tournament is the most important for you for the season. Why is that? RAFAEL NADAL: Well, always is the tournament where I feel that I have more chances to win ‑‑ if we talk about the Grand Slams. So this is my biggest chance of the year. If I win this tournament, I know my year is fantastic. You are able to play with less pressure the rest of the season; you are able to keep playing with the same attitude, with the same positive attitude playing every day, but with less pressure than before and with better confidence than before. So win this title always was very important every season. For me, when I won here, I always had a successful season. So in general, this probably the most important tournament of the year for me. Q. Can you talk about maybe how tough it was today and what was the key to succeed today? RAFAEL NADAL: Well, Roger, I think, played a fantastic tournament, in my opinion. His level was very high during both weeks; semifinals match was very, very high level. Today I think he did well. He was a little bit unlucky at the first set, and after that, he came back fantastically well in the second. In the third I had 4‑2, but seriously, I think he played very, very good from that moment to the beginning of the fourth. So when Roger plays like this, the opponent has nothing to do sometimes. I just waited my moment, tried to be there all the time, tried to put him in not easy situations all the time. And save the Love‑40 of the first game of the fourth was very important for me, no? That was a big turning point of the match, in my opinion. I think Roger did well; I think Roger played well, played good match. It's true my style is a little bit different than Djokovic style for him. I let him play higher than Novak, so for him sometimes it's more difficult to go inside and to hit the ball in perfect conditions all the time. But in my opinion, today it was very hard, because sometimes ‑‑ a lot of times in the past when I serve against his backhand I was able to start the point under control. Not today. I think he returned very well with the backhand, better than ever in this tournament. So that was a big problem for me. Q. Your focus has been very intense since the start of this tournament, perhaps more than any of us have seen here. Is that because you came in here perhaps a little hurt by your losses to Djokovic in Madrid and Rome and you were very, very desperate to win this title? RAFAEL NADAL: No. I think I came here probably with a little bit less confident than other times for that reason, because I saw him playing fantastic. Even if I was there and I was happy about my match in Rome, was hard to lose another time. Lose four finals in a row is not easy. My feeling was I am having a fantastic year, because was six straight finals when I was healthy. Before I had problems in Doha and Australia, so when I was healthy, I was every time in the final. Normally I have a good record in finals. This year I only had the chance to win two. Even if I had very good chance ins Indian Wells and Miami to win the finals, I didn't. So that was hard for me mentally probably. For that reason, I started the tournament a little bit less confident than other times. Q. Rafa, in the beginning, after Federer had won against Djokovic in that great match and he led 5‑2 and he was playing some of his best, did that really make you think, What is this? This is not one of our regular finals here. Were you more scared for the match at that point than any other final? And the second thing is, when we look at the match, you have been very like letting Roger lead the game. He makes mistakes or he makes points. Did you think he would win on percentage overall? RAFAEL NADAL: I think was tough to say that, because with the 5‑2 wasn't an easy moment for me. But 2006 I lost 6‑1 the first set, so worse than 2006 wasn't. I know the first set was important. Always is important set for me, the first one. But even if I lost that set, you know, on clay the matches are long, and it's not easy to play all the time at your best and play aggressive and play with no mistakes. Roger was doing that very well in the beginning. I say before, I was lucky with the 5‑2 and with the 5‑3. After that, I think I played very good tennis for the next two sets. Q. Last week you came in and were very honest and open about not feeling confident. Now, can you tell us what it is that was able to change your state of mind and make you more confident? Was there something in the match with Soderling or before or after where you suddenly were able to turn the switch on on your confidence? RAFAEL NADAL: Seriously, I was practicing not that bad, so that's a point that give my confidence. But what I didn't understand very well is when I go on court and play match, I am playing with too nervous, too anxious. For that reason, I wasn't able to play the same in practice than during the match. But when you feel that you can play good in practice, you know, the feeling of play well is not that far. So that's give me confidence at the same time. Q. Is it a mystery how it comes and goes even for you, the confidence? RAFAEL NADAL: Well, it's not a mystery, no, because sometimes happen like this. You are not playing that well, but when the opponent let you play at your best, you are ready to do it. If I was practicing well, I had a good chances to do it in the match when the opponent give me ‑‑ let me play at this level, no? It's true, from the first round I wasn't able to play this level. Second round neither. But after that, I think third round, fourth round, I had to play much better than what I did, because the level start there in the practice. So I didn't probably because the opponent wasn't ‑‑ they don't give me (through translation) T hey didn't demand that level. Even for the match of Soderling I wasn't confident, but I was on court. I was able to play, focus, and to start to play my tennis on clay. I finished the tournament playing very high level of play for me. Q. Is it possible for you to compare how satisfied you are with today's win compared to some of your other titles? Seems like a massive achievement for you. RAFAEL NADAL: Well, every title is ‑‑ always this kind of title is very satisfying. It's difficult to say this one, I am not satisfied with this one, because to win a tournament like this you have to be playing really well. But sometimes when you fight a lot to win, when you try your best in every moment to change the situation, it makes the title more special. For example, in 2008 I think I played better than ever, but I finished the tournament and, you know, I didn't feel that I won Roland Garros because I won in three sets. Not that difficult fourth round, quarterfinals, semifinals, with not many tough moments. Playing fantastic tennis, but every tournament is very special. But when you come back after not easy situation, makes the tournaments and the victories more special for sure. Q. You said to win Roland Garros is fantastic. You now will have less pressure on you for the whole year. Now that you have won, do you feel relieved? Do you feel younger than 25? RAFAEL NADAL: No, I feel 25. I am happy with 25. I don't want to go back four or three years, because I don't know if I am ready to do what I did another time. So, no, I am happy. All the victories makes me happy, but not the victory is what makes me happy. What makes me happy is what I had to do before to have a victory like this. So a lot of hours of practice, a lot of moments with high intensity, with positive attitude. When things are not going well, keep progressing with the same attitude. That's what makes me happy; that's what makes me feel very satisfied with myself. Not have this title for sure ‑‑ this title is very important for me and for everybody, I think, but what makes me feel very happy is all the work what I did to be here and to win the title another time. Q. You said before that you weren't confident coming here. How do you feel going into Wimbledon? RAFAEL NADAL: Well, before Queen's, so not Wimbledon. Now I have to work a little bit on grass. You know, is always a big change. Even if I had success on grass last years, for me is a big change all the time. So I have to adapt my game another time and try to remember what I did well on grass, why I played well on grass, what I have to do to have the same feeling another time there. That's hours and hours on grass court. So I going to start tomorrow a little bit. Play doubles hopefully Tuesday, and Wednesday start the singles. After winning a title like this, you go there with a different attitude, with very positive confidence. So for me, win here makes me play Queen's and Wimbledon with less pressure. Not for that with less allusion or less motivation. Q. Congratulations. You equal Bjorn Borg's record of six here. What does that mean to you? I spoke with Jim Courier, and he thinks that maybe your six are more impressive because of the level of competition you faced in getting them. RAFAEL NADAL: Well, for me it's something very special equal the six titles of Bjorn, for sure. 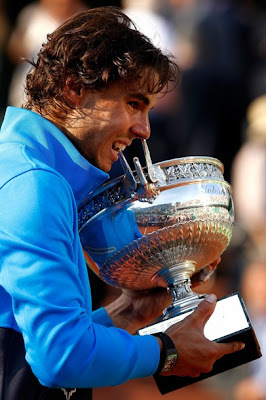 But for me, the most important thing is win Roland Garros, no? It's really honor to have this record with him. I going to keep working to be here next year and to try to play well another time. But today is a day to enjoy this title, because is very difficult win this title. Six times are a lot. So seriously, it's a real honor, the comparison with Bjorn. Q. Rafa, can you tell us about the final and about the tournament in a few words, how you raised your level of game and how this process took place? And likewise, when was the real Rafa back? RAFAEL NADAL: Well, the real Rafa is both the Rafa who wins and the Rafa who plays well and the Rafa who suffers and doesn't play that well. You have to face this situation. You also have a Rafa that plays very well and wins. These two Rafas are real Rafas. The most positive thing is that I was capable of reversing situations and keeping a good attitude in order to reverse the situation. I prepared, I practiced, I focused, and motivated myself thinking things would change. Even though sometimes things were not very good for me, I knew that at the end of the day things would turn out right for me. So I had this positive attitude that was sufficient to change the situation, especially during the first week. Today's match, likewise, I mean, I started slowly. He was very aggressive and it was very difficult. Q. I have two questions: First, when you reached the fourth set after losing the third, we saw that you had a slight injury and you recovered. How did you manage to come back? Second question, how do you feel after winning this tournament? RAFAEL NADAL: When the third set was over, the only thing I felt is that this is going to be a very complicated match, because he played at a very high level and I had to find a way to win. When Roger plays at this level, the only thing we can do is observe and wait because he's fantastic. So you need to wait with a good attitude, to be ready, and take all opportunities. At one stage, I thought he was playing better than me. I was down Love‑40. I knew I could come back. This was a key game in the match. I was thinking, Well, he plays very well. At the moment, he plays better than me. But you have to keep playing and wait for the right moment in order to try and take control of the game again. But I also had another thing in mind. For example, if he wants to win, he has to keep playing at this level of game during the match. I didn't want to make things easy for him. That was clear. So I had to make it difficult for him. At one stage, I had an opportunity; I took it. This is when I started leading again. Q. Congratulations. What about when there was the rain? You had to wait. How did you manage that? Was it like in Wimbledon? Are you getting used to it? RAFAEL NADAL: Well, it was very short. We were at 5‑4, 40‑All; these were very important points. Winning the second set was almost vital for me. I knew that during the second set he had to maintain a very high level of tennis in order to win. It would have been impossible. For two hours and a half it was very difficult to do. The match was more in my favor after I was leading two sets to love. Then I made a mistake; I did not return well on one point. He had a set point, but I managed to win the second set. Q. At the beginning of the tournament, you said you have to raise your level or you go back home. RAFAEL NADAL: Well, for me, what's important is the tournament; winning the tournament is the most important. I think Djokovic deserves to be at his ranking. I don't know if he is No. 1 already. I don't know if he can be No. 1 after Queen's, Wimbledon. Each match is very important, like a match point. But in any case, I want to be very competitive. I want to stay at a very high level. This is my seventh final in a row for this season, so things are fine. My objective is to continue with the same level of intensity, motivation, and continue playing very well. Along the year I had ups and downs, but I'm very happy and satisfied. Q. Rafa, Roger is regarded as the best player of all‑time by many people. What happens when you look at your record compared to his? You won 17 titles and many other statistics are in your favor. RAFAEL NADAL: Well, it means I can play well as well. It means that things went well when we played against each other. But this does not prevent anything else. And when you talk about these statistics, when you try and make these comparisons, really it's not very interesting to me. I'm very happy with what I have, with who I am. I'm not the best player in the history of tennis. I think I'm amongst the best. That's true. That's enough for me. I have a very high level of tennis. I am quite satisfied, and very happy with what I managed to do. I'm very thankful for everything that's happened to me up until today. I can't say that the opposite. Now I need to continue working and do everything I have to do from a mental and physical standpoint. Q. First of all, congratulations. You started this tournament being a bit anxious. Was it more anxiety than you've felt in other tournaments? If so, why? Second question, there were times where you could have closed the match before. Was it because you felt pressure? Did the crowd play a role? RAFAEL NADAL: Well, I think the atmosphere was awesome. I think the crowd, the people out there were very supportive. Maybe a bit more of Roger, but that's not a problem. I think the people were very respectful. I had no problem. Now, about your question about anxiety and fears, I think during this tournament I was probably a bit more anxious, at least more anxious than I should have been, and more anxious than usual. But you know what, when I come to Roland Garros I'm usually a bit more anxious than other tournaments. It took me a bit of time to overcome this feeling. But in the other years it was the same thing. Q. The crowd was shouting, Roger, but also, Nadal or Rafa and there were many Spanish people. RAFAEL NADAL: Yes, the Spanish people were there. They were wonderful; they supported me. There were people coming from Spain, Mallorca, and there are people supporting me through TV throughout the world. To me, it's a great satisfaction knowing that some people want me to win. That's something that helps me a lot. I think the crowd here was very respectful. The other day they were slightly more aggressive during the match between Novak and Roger, but today they were really fair. They saw a match that was a very high‑quality match. I think it's a very special match as well, because of all this past or history that we have, Roger and I.
Q. Can you explain what you felt when you finished the match? Did you ask yourself the question as to whether you were the second‑best player of all‑time? RAFAEL NADAL: I didn't ask myself this question. I was just happy I won Roland Garros. Beating records is fine; it's perfect. It's an honor to say that I have as many wins here as Borg, I won as many titles here as he did. That's awesome. There was a lot of emotion. But the main satisfaction comes from all the work you did to get to this stage. You have difficult moments; you have wonderful moments. You come here, and I work with a team which has always been very supportive. Without them, it would be impossible for me to be here today. It's all thanks to them. Quite honestly, I had lots of emotions when I won. You know, sometimes some matches were more difficult. As I managed to overcome my difficulties, I had the reward, which is this trophy. That's a great satisfaction because of all the work I had to do to succeed. This is what gives you satisfaction. Thank you very much.